Champion 3-year-old and champion sire Thunder Gulch has been euthanized at the age of 26 due to the infirmities of old age at Coolmore America’s Ashford Stud in Versailles, Ky. Known for his toughness and fighting qualities Thunder Gulch was the star of the 1995 Triple Crown races when he won the G1 Kentucky Derby, G1 Belmont Stakes and was third in the G1 Preakness Stakes in the colors of Michael Tabor. In addition to his classic wins Thunder Gulch also earned top-level victories in the G1 Florida Derby and G1 Travers Stakes which propelled him to the title of champion 3-year-old male of 1995. Retired to Ashford Stud for the 1996 breeding season, Thunder Gulch went on to a highly successful stud career that was highlighted by a champion sire title in 2001 when his star performers included Horse of the Year and future Hall of Famer Point Given. His other Grade 1 winners in USA included Spain, Circular Quay, Balance, Tweedside, Shotgun Gulch, Sense of Style and J. B.’s Thunder. 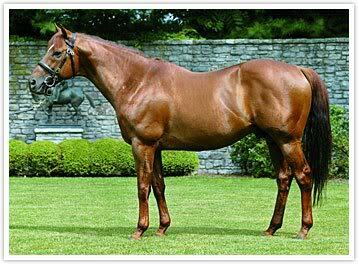 Thunder Gulch also left his mark on the international bloodstock scene when spending seasons in Australia, Japan, Argentina and Chile during his stud career. “It is a very sad day for us here at Ashford as Thunder Gulch has been a pleasure to be around all these years and has left a major legacy at the farm as the first champion sire to reside here,” commented Coolmore America manager Dermot Ryan. “He had a remarkable 3-year-old campaign in the hands of Wayne Lukas and Gary Stevens and provided Michael and Doreen Tabor and their family with some great days.